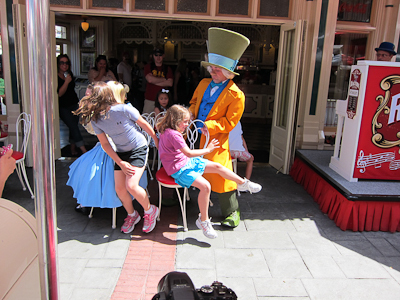 Today we’re going to chat about playing musical chairs with the Mad Hatter. I had heard of this but had never actually witnessed it myself until one day when I was enjoying the amazing hot angus beef sandwich at the Jolly Holiday Bakery (highly recommend) and I glanced over into the Coke Corner (also known as The Restaurant That Can’t Decide What It Wants To Be Called) to see Alice and the Mad Hatter come over and start arranging chairs in a circle. This happened at about 2:30, by the way. My understanding is that Alice is not always present at this event. Thankfully, Alice was there to translate. 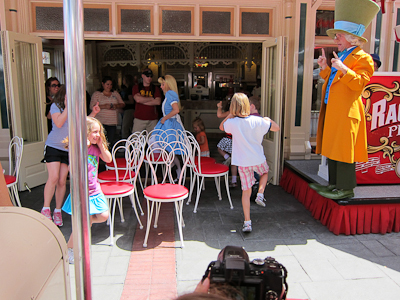 Musical chairs then commenced, but the Mad Hatter couldn’t abide by a regular old game of musical chairs. Oh no, he could not. 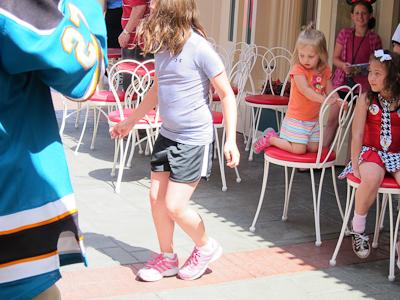 The children had to do a number of things while circling the chairs. First they merely had to skip. But then, they had to pretend to be pirates with a peg leg, and hop on one foot, cover one eye with a hand to simulate an eye patch, and make the other hand into a hook. 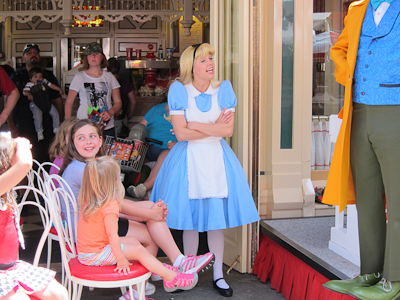 The Mad Hatter enjoyed waxing rhapsodically, but Alice did not approve. Mine! No, mine! No, mine! No, mine! The Cheek Check involved the pair having a dance-off. This little girl did a seriously awesome Running Man. The game continued until, predictably, there were only two children left. And ZOMG only one chair!!! 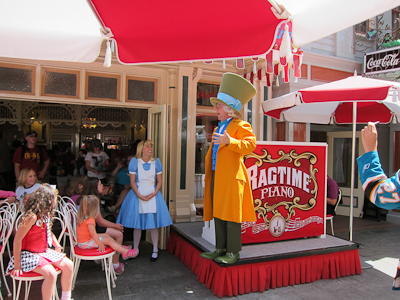 The pianist struck up a tune and Alice led the finalists around the courtyard, through the quick service window, and basically around a lot of stuff while the Mad Hatter added a bunch of chairs to the stack. The finalists were understandably confused about where they should sit when the music stopped. However, the Mad Hatter declared them both winners. They got to put the chairs away. HA! The musical chairs performance was such a fabulously fun performance, I highly recommend anyone hanging out near the Coke Corner at around 2 or 2:30 to see if you can catch it! Cool, I loved playing musical chairs when I was younger. Me too! It’s a lot of fun with the live pianist too. Sounds awesome. Hopefully they will do this in November when we are there next! They should be–it’s been around for a long time. I’ve seen this tea party a few times and each time it’s been entertaining. Once, they let my friend play (who’s an adult btw, usually it’s only for kids.) 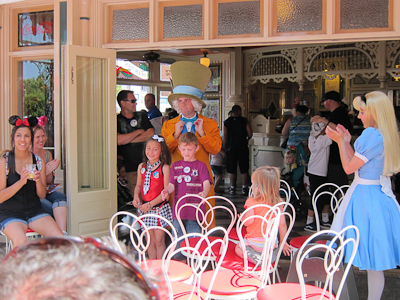 I was wondering and since you’re the D-Land guru, do you know if the Mad Hatters Tea Party at Ca Adv. will be the same thing? No, the Mad T Party is totally different. It’s an evening/nighttime dance party like ElecTRONica. 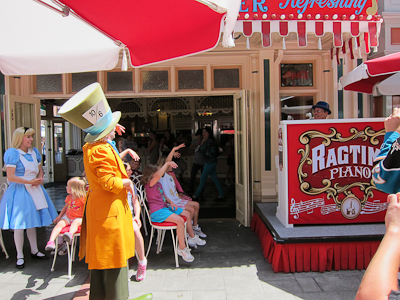 You can see some initial pictures here: http://micechat.com/forums/disneyland-resort/168117-mad-t-party-soft-opens-photos-discussion.html . It looks super-cool! Yay! You finally covered Musical Chairs. This should be in the times/entertainment guide. Sandwich = amazing, and I am both very picky and a food snob. I ordered it without the horseradish so it did take a few extra minutes, but my sandwich was nice and hot. How fun! 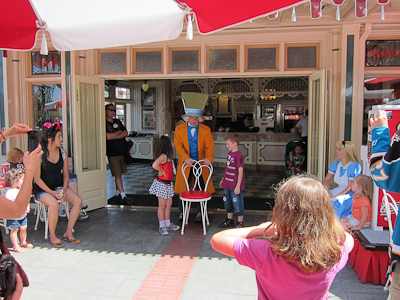 When we were there in April we were coming out of the bathrooms behind the Plaza Inn and the Mad Hatter came out from the cast area there. He spotted my two-year old and asked her to go for a walk with him. They walked hand-in-hand all the way over to the castle, and he talked to her the whole time. It was so cute. That’s so sweet! I’ve seen Mickey and Minnie do the same in Town Square. What a way to make a child feel special! This will be one of the top things to do when we next go (whenever the heck that will be) – this and Jedi Acadamy (why don’t they have that one for adults?) !! I know! Man, I would TOTALLY love an adult Jedi Academy. You’re welcome! Thanks for reading :). I agree–Disneyland has great hot dogs. Corn dogs are my favorite. I have not seen this little show before and will try to catch it today…………great action shots! 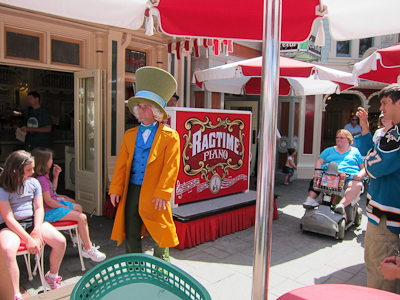 That sounds confusing but funny to watch…and I would really like a fantasmic popcorn bucket! Is it always around 2:00? I caught it around 2:30 but I’ve heard it can start as early as 2. 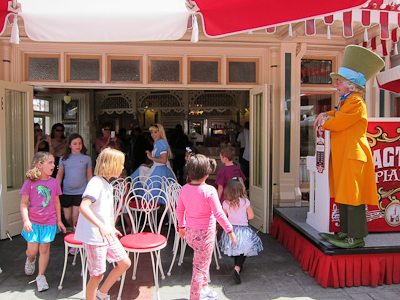 I recommend taking a late lunch at Jolly Holiday and see who shows up. I’ve watched this several times, it’s always such a hoot. ❤ …..ALSO! I'd love a fantastic Fantasmic! popcorn bucket!! I was reading your post and my daughter walked over and shouted “Mickey Mouse!! Mikcey Mouse!!”. So, since it’s difficult for 3 year olds to enter…or type…I am entering for her! 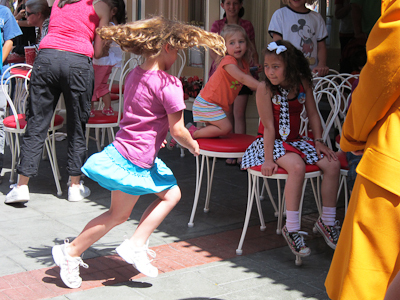 🙂 She is into the Mickey Mouse…I want to play musical chairs with the Mad Hatter! And you know I have a special place in my heart for 3 year olds ;). Yay 3 year olds! I have one leaving soon (in July, will be 4) and one entering soon (will be 3 in November. Very cool! Holy Banana’s that POPCORN BUCKET IS AMAZING! 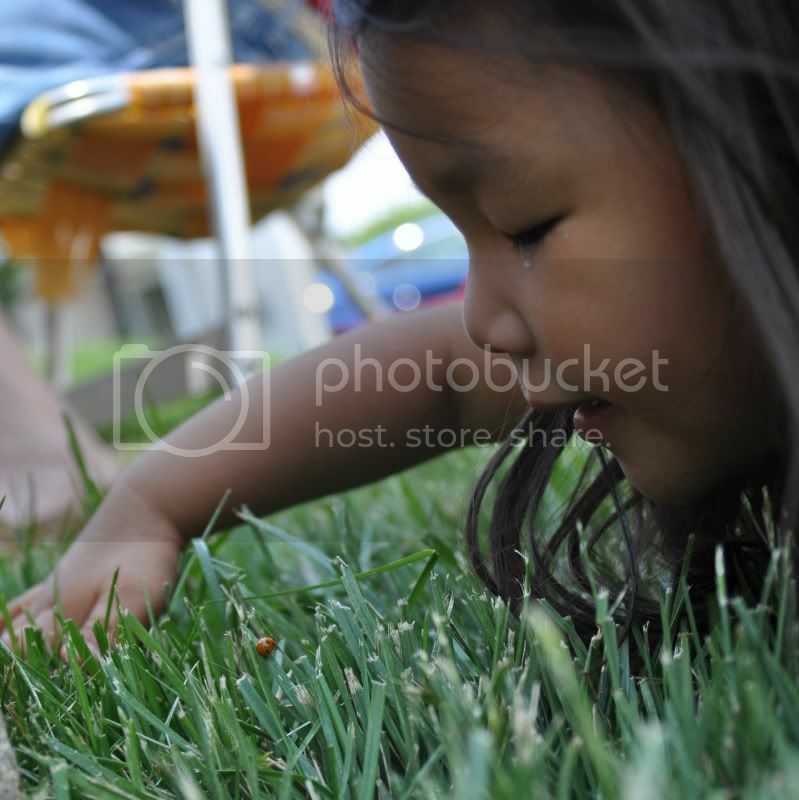 This is a great blog, very cool! I’ll “favorite” it now. Reading your blog always makes me want to be 8 years old again (I like even numbers). It also makes we want a fantastic popcorn bucket. Thanks for sharing your adventures with us.